FILE - North Korean official Kim Yong Chol, right, prepares to leave the Beijing International Airport in Beijing, Jan. 17, 2019. 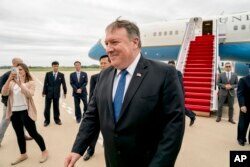 FILE - U.S. Secretary of State Mike Pompeo arrives at Sunan International Airport in Pyongyang, North Korea, July 6, 2018. That meeting yielded a pledge from the latter to work toward denuclearization of the Korean peninsula and Trump declared the next day that there was "no longer a nuclear threat from North Korea." There has been little obvious progress since, however, which was underlined by the Missile Defense Review unveiled Thursday. 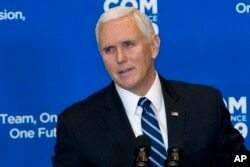 FILE - Vice President Mike Pence speaks at the Department of State in Washington, Jan. 16, 2019.